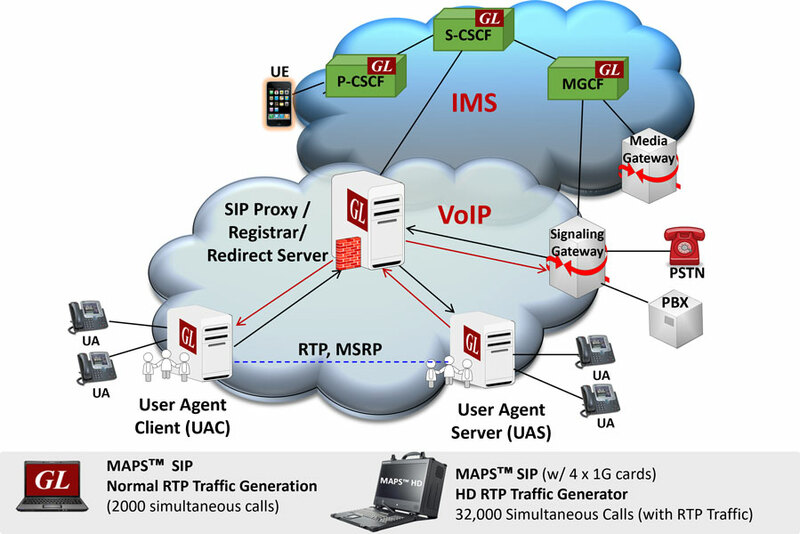 Gaithersburg, Maryland, USA – January 10, 2017 - GL Communications Inc., announced today the release of its enhanced MAPS™ SIP Protocol Emulator that help user generate and receive SIP signalling with traffic. Speaking to the press, Mr. Karthik Ramalingam, a Senior Manager for Product Development of the company said, ”GL's Message Automation & Protocol Simulation (MAPS™) designed for SIP testing can simulate any end point in a SIP network such as User Agent Client- UAC, User Agent Server-UAS, Proxy, Redirect, Registrar and Registrant servers. This test tool can also be used as a bulk call generator to conduct performance/stress testing. He added, “Secure Real-time Transport Protocol (or SRTP) can provide encryption, message authentication, and replay protection to the RTP/RTCP traffic. SRTP traffic is initialized over TLS (Transport Layer Security) / Secure Sockets Layer (SSL) network protocol (OpenSSL) with a Certificate and Key. SRTP encrypts the actual media portion of the calls preventing eavesdropping and tampering. He further added, “The MAPS™ also provides SIP Conformance Test Suite designed with 300+ ready-to-use test cases, as per SIP specification of ETSI TS 102-027-2 v4.1.1 (2006-07) standard. Test cases include general messaging and call flow scenarios for multimedia call session setup and control over IP networks. Logging and pass/fail results are also reported. Test cases verify conformance of actions such as registration, call control, proxies and redirect servers. Each SIP message template facilitates customization of the protocol fields and access to the various protocol fields from the scripts. Scripted call generation and call reception. Supports both RTP G.711 Pass Through Fax Simulation (PKS200) and T.38 Fax Simulation over UDPTL (PKS211). Supports conference (third-party added), attended call transfer, and call forwarding. Test IVR, and Instant messaging features. Supported clients for CLI/APIs include TCL, Python, VBScript, Java, and .Net.